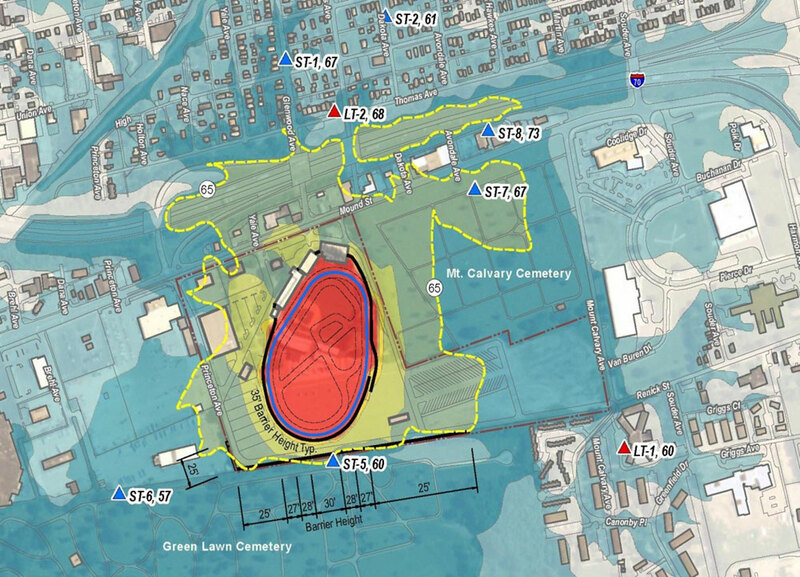 HMMH conducted a noise analysis study for a proposed new racetrack facility in downtown Columbus, OH, at the site of the former Cooper Park baseball stadium. HMMH was selected by a committee that included the developer, the City of Columbus, and area residents. HMMH’s analysis evaluated the sound levels from proposed racing activity in the context of the City of Columbus noise ordinance. Modeling with SoundPLAN® allowed us to present results in a way easily understood by the public and City officials. Our analysis recommended noise barriers around the proposed track to significantly reduce noise in the community while allowing racing activity. HMMH also assisted in the development of a “Good Neighbor Agreement” that would involve sound level monitoring during racing events to ensure compliance with the City’s noise ordinance. The proposed facility renamed SPARC, was approved unanimously by the Columbus City Council.